How to Reach: Miramar beach is easily reachable from any place in north Goa as it is very close to the capital city Panaji. One can hire local transport to reach the Miramar beach in Goa. the Miramar beach in Goa is definitely worth the visit. It is easily accessible as it is quite close to the capital city and any kind of local transport like taxi, auto or a bus can take you there. 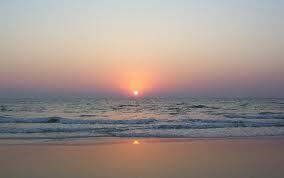 The Miramar beach is located at the confluence of the Arabian Sea and an estuary of River Mandovi. The Miramar beach is also known by the name of Gaspar Dias. The beach was named Miramar by the Portuguese when they came to India and the name essentially means "viewing the sea". The Miramar beach is a beautiful expanse of fine golden sands that is dotted with tall coconut trees. The vast blue sea in front of the beach is just mesmerizing and during sunset, looks absolutely marvelous. The beach is lined with thick covering of palm trees that provide an exotic look to the beach. Tourists can always take a long walk under the shady trees and relax on the beach. The Miramar beach looks magical on a moonlit night when the silver moonlight makes the sand glow in a whitish silver shade. The Miramar beach is thronged by numerous winged guests during the migrating period. Tourists frequent this place during the time the migratory birds come here. One can find over 500 species of birds like gulls, plovers, etc. coming to the Miramar beach every winter in order to escape the harsh winters of the north. The beach provides the ideal site for them to stop and nourish themselves. Food is available in plenty in the form of small fish, crabs and other small aquatic creatures. They provide tourists an opportunity to capture them in their cameras as they fly and dive here and there. So visit Miramar beach for this magical experience.